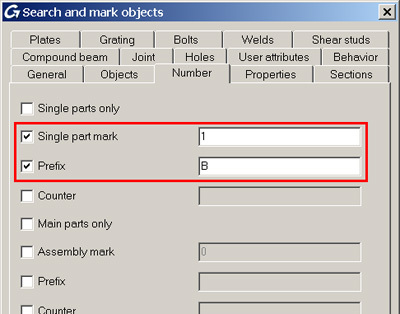 In your 3D model, there is a beam that has the single part mark "B1". Select "Complete model" on the "General" tab. 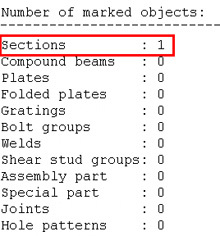 Select "Section" (if it is a beam you are searching for) on the "Objects" tab. 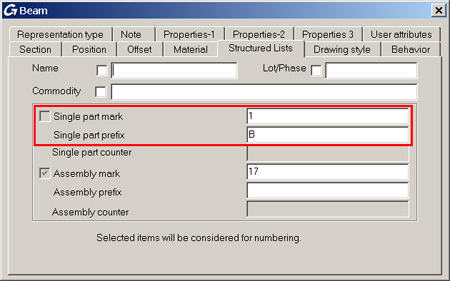 Select "Single part mark" and enter "1" on the "Number" tab. Select "Prefix" and enter "B" on the "Number" tab. The command line shows if such a section has been found in the model. And the found beam has a red color. Comment 1: you can have an arrow pointing to the found section by using the "Search marked objects" icon (available on the "Standard" toolbar) so that you can better find it (e.g. in a big model). Comment 2: to remove the red color of the beam, just click the "Clear marked objects" icon.